When buying LED strip there are several parameters you should be looking at. One of those is how many LED modules have been placed per meter of strip. 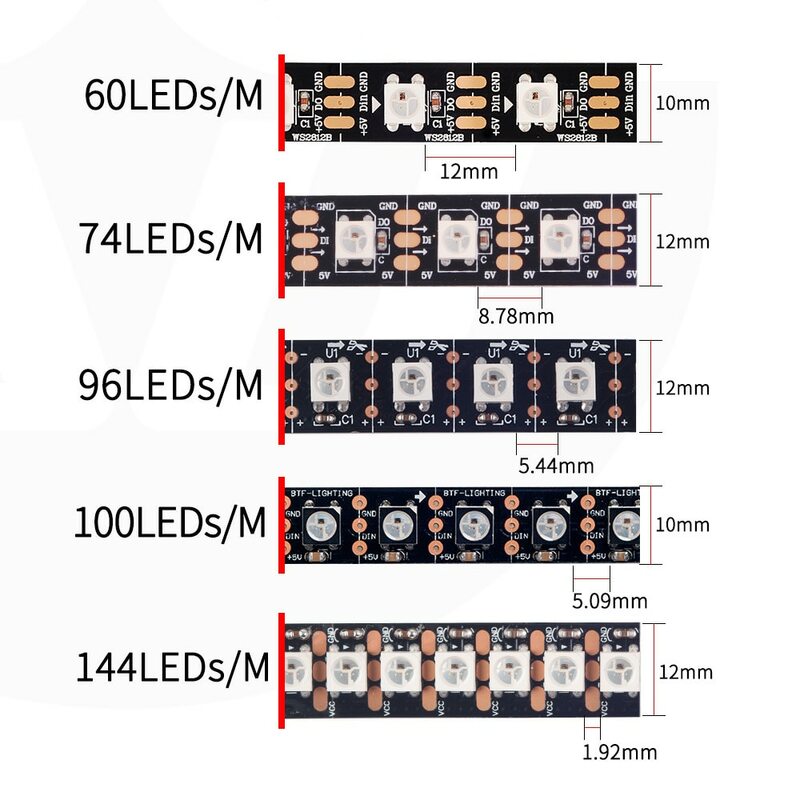 Price is very often directly tied to this parameter because the higher the density of LED modules on a strip the more the cost of the strip will be! Common values are given in either LEDs/m or total amount of LEDs per 5 meter (length most strip gets sold in). Take a look at this table and then the picture below it illustration the difference. Though this is certainly not always the case, a 60LED/m strip can be brighter than a 120LED/m strip! Most of the cons can be countered pretty easily with things like using more voltage feeding points on the strip and using larger aluminium profiles to mount the LED strips in but they are issues to take into account when looking to deploy LED strip. An important factor is this is the QuinLED module itself actually. QuinLED has one function and that is to dim LED lights, that means that issues like heat disappear if you are never going to use your LED strips above a certain dim value. Personally I use the Colordiode strips and they put out an insane 2000 Lumen/m, way too much for daily use so they are mostly dimmed to about 25% output making heat a non-issue. I also always recommend using an aluminium profile when installing LEDs to make sure the LED gets proper cooling! How much LEDs/m do you need? You need to figure out per project how many LEDs/m you are going to need. If the LEDs are close to a diffuser for instance you want as much LEDs/m you can get so that you can’t see the individual LEDs anymore. But if you are lighting an object that isn’t 1cm away but for instance 30cm away, lower amount LEDs/m strip will be fine and blend together way before it reaches your object. Nowadays I mostly pick up 96LEDs/m or 120LEDs/m strip both in white or color versions since prices for those versions have come down over the last year or so. For my personal projects I mostly look at the balance between LEDs/m and cost while also taking length into account. But with a lot of strips now coming with 120LEDs/m and still being relatively affordable, using 24v and double feeding, a high quality 120LEDs/m strip can still be used up to 5m without a problem! At full brightness one of these strips might use up to 140 watt though, so make sure you know what you want to use them for and use the right thickness of wire and power supply! The same strip but with 60 LEDs/m would only use up to 70 watt max! So try to find a balance between what you need, want and what it costs.